What Are the Benefits of Being a Truck Driver? Contrary to popular belief, truck drivers make good pay. In fact, first-year drivers can potentially make up to $70,000 per year, while seasoned drivers can make up to $90,000 or more per year. Why worry about going back to school and getting a degree when you can make that much money driving a semi-truck? There aren’t a lot of people who decide to become truck drivers, partially because there’s a pervasive myth that it’s a low-paying job. As you’ve already seen, that simply isn’t true. However, because there’s typically a shortage of good CDL truck drivers, they are generally in high demand. 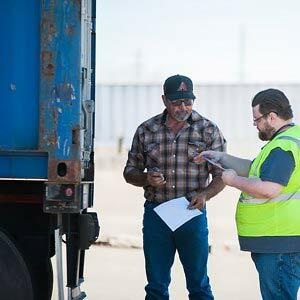 That means you have a good chance of landing a job once you receive your Class A Commercial Driver’s License (CDL). The DSL Mobile app makes the trucking business even more lucrative for drivers and helps them stay in the loop. Gone are the days when drivers were treated poorly by trucking companies. Now, truck drivers have more tools, options, and opportunities to make good money. People pay good money to travel the nation and see new places, but you get paid to do it when you’re a truck driver. You’ll have plenty of opportunities to meet new people and see a variety of landscapes when you drive for a living. At Duncan and Son Lines we offer local and regional CDL jobs giving our drivers a chance to travel while still being close to home. If these four truck driver benefits are appealing or you’re tired of driving for your current carrier it might be time to call Duncan and Son Lines. Find out about available employment opportunities by contacting 623-386-4511 today. Previous PostPrevious What Is Life Like as a Truck Driver? Next PostNext How Many Hours of Sleep Do Truck Drivers Need? How Will Self-Driving Trucks Affect Trucking Jobs? COPYRIGHT DUNCAN AND SONS LINES INC.